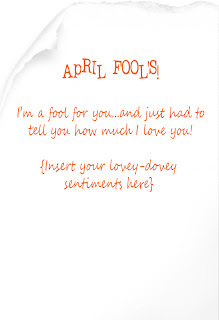 Any holiday can be turned into a lover's holiday...April Fool's Day is no exception! 1. Cover a regular sized envelope with a piece of orange cardstock (print the words right on the cardstock and cut out to envelope size). 2. If your spouse drives to work, make a visit to the lot where they park the car. (best case scenario: about an hour before they get off work). 3. Place the ticket under the wiper or in the gap of the driver's side window. Today's the 30th--you've got 2 days! Happy Fooling! Hi Cher! Thanks for coming over and saying hi! I love your blog! Thanks for the fun April Fools ideas - I need to do something fun! Ok- so I love love YOUR blog! Seriously, as soon as I start feeling better I am gonna do so many of these ideas. I am gonna start with that parking ticket one and do it on April fool's. It is great to find a blog like yours that has so many awesome ideas to spice things up. LOVE it....thanks so much! That's a great idea! I need to modify the parking violation though to something else. I'll have to think it over. I'm sure I could come up with something. hee hee hee... I was thinking of covering cotton balls in chocolate and pass them off as truffles at work... think I'd get in trouble? That is awesome! Maybe even worth the 45 minute drive to dh's office to pull it off! Just came by to welcome you to the SITStahood! now this is just getting funny.Lol. I moved to Alaska to get away from california! I wanted winter. I still do I just want easier access to get away.Lol. I came from sacramento. My parents are still there. I did this prank this year...it was simple and fun...thanks for the idea! !